You may join Chet for just the session you're interested in, or join him for all seven topics/sessions! 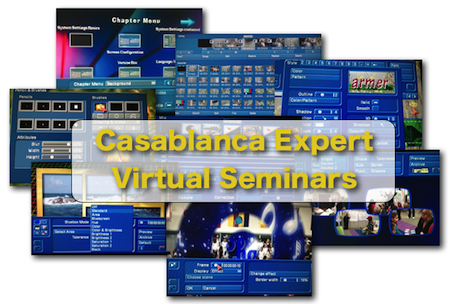 This will be an opportunity for folks to learn intermediate/advanced skills from the Casablanca Expert in the comfort and convenience of your own studio/office, with the cost savings of avoiding travel expenses! We'll join together using the latest in internet technology (using the GoToWebinar services) and learn directly from Chet Davis. It will be a _live_ seminar where you follow along the instructor, with a front row seat! Chet will be demonstrating & teaching- showing you his Casablanca screen on the web-cam which will play on your computer monitor. And each session will be recorded so you will have the opportunity to review the lessons and maximize your learning! "I am holding registration for each of these classes to only 20 learners per session -- I expect them to fill up fast"
Since this is a Virtual (Online) Seminar - you can choose to follow along with Chet, or you can view the lesson on your computer monitor - soaking up Chet's teaching, taking notes as you see fit, and then view the recording later. Then you can always come back and re-view the lesson recording and follow along...whatever suits your learning style. NOTE: This is an Intermediate/Advanced session is not for beginners, you should be comfortable with the use of your Casablanca editor - a recommendation is that you use your Casablanca daily or regularly... that's the kind of fluency or comfort level we are striving for with this workshop. This does not mean you can't ask questions or even that you should not have questions... but rather we want to ensure the skills of the workshop participants is at a level that allows us all to reach new heights.